QuickSTART is a streamlined start-up process supported by CTO in which engaged parties (sponsor, investigator and institution) agree to work in a streamlined fashion toward a 90-day study start-up goal. The clock starts ticking when sponsors send final study documents to their selected sites. 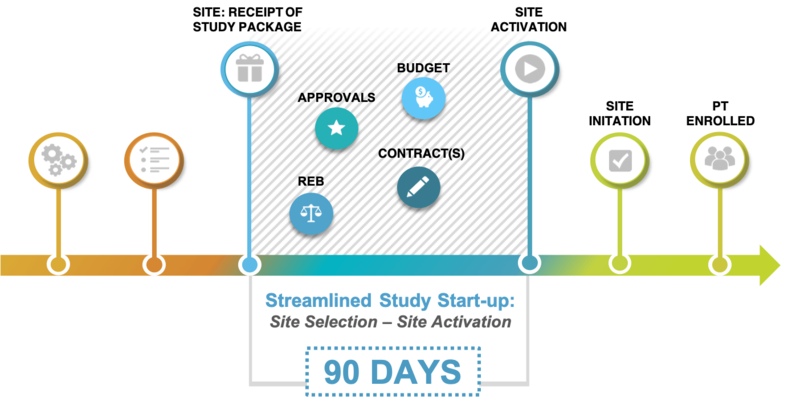 Within 90 days, QuickSTART helps make sites activation and enrollment ready. Sponsor, site and investigator agree to using the QuickSTART approach. Sponsor creates an application on the QuickSTART digital platform and submits to the site with full study document package.